It began when officers told the man that he was not allowed to be filming their activity with his cell phone. They commanded him to walk away and to not view what was happening behind a white wall that separated them. He grew suspicious of why cops did not want him to see what they were up to. Given that they are public servants and they live off of the money that hardworking Americans make to support them, cops should expect to have their every action monitored and scrutinized publicly. Just one instance of pretending to be a “tough guy” and assaulting a citizen could make a cop famous online and cost him his job and reputation. Most cops are aware of this, given that everybody nowadays can begin filming them instantly with a cell phone. But these cops still acted alarmed when they saw a man filming them. Rather than obeying the officers’ commands to walk away like a domesticated cow, this brave man took out his own surveillance drone and launched it into the night sky. He flew his drone directly above the police activity — right over their heads. 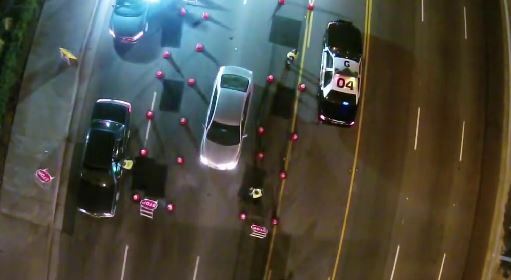 He was able to get clear footage of the cops performing a “checkpoint.” It turns out they were pulling drivers over by force and demanding their paperwork. The officers can be seen in the video nervously looking up into the sky, shining their flashlights at the drone and not knowing what to expect. This man’s bravery is sure to lead to more citizens equipping themselves with drones so they can remotely view whatever cops are doing in their communities. One idea is to have three people at a time filming cops: one person is up close filming with a cell phone, the second is in a hidden location filming how cops react to the first person filming, and a third person is in an even more remote position with a drone monitoring the entire situation from the air. The advantage to this is that it allows the footage to survive before the cops can tamper with it, as cops have often confiscated phones to delete the footage of their abuse. You can find a wide selection of drones to use for personal projects, including the high-end DJI Phantom which comes with an HD video camera; or if you’re looking for something more affordable, there’s the Axis Gyro for just $60. The video was originally uploaded to the Facebook page Hack Read and can be viewed below. The man who filmed the video is Tom Zebra. You can find his facebook page here. The video was originally uploaded by Onus News Service.